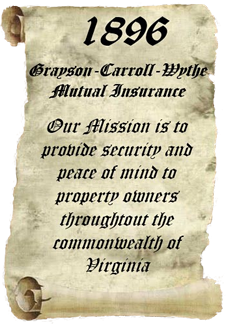 With our roots firmly planted in southwest Virginia since 1896, our mission is to provide security and peace of mind to property owners throughout the commonwealth of Virginia. We will provide property owners with reliable coverage and exceptional customer service at an affordable price while maintaining a strong financial position for the protection and benefit of all our policyholders and a stable market for the agents who represent us. Since our beginnings, one thing has remained constant – our promise to be there when you need us. We are committed to excellent service, fair and equitable relationships, and the highest ethical and professional standards. We will measure our success by our ability to meet and exceed the policyholder’s expectations of service and expertise, our ability to provide a stable market for our agents, and our ability to increase policyholder's surplus.